The Week in HD - Monday 20th January | What Hi-Fi? You can also get daily updates on what's on by following our twitter feed @TodayinHD. 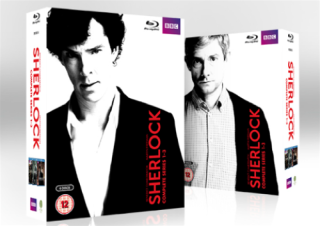 Here it is - Sherlock's thrilling return in series 3 is all yours to own in DVD and Blu-ray. Questions are answered (or are they?) as Sherlock returns from his apparent death in The Empty Hearse amidst conspiracies and new relationships; John and Mary have an eventful wedding in The Sign of Three; and Sherlock has to deal with the most hateful man and most powerful blackmailer in the world to protect the ones he loves in His Last Vow. And if you want all nine episodes in a brand new and strikingly designed package (see picture above), the full three-series boxset is out today, too. Our wallets will be empty. This Blu-ray box set contains all of the Eleventh Doctor's Christmas specials, including the latest instalment - The Time of the Doctor - in which Matt Smith takes his bowtie off in the Tardis. There's a special farewell featurette for Smith, but our personal favourite special in this boxset is the utterly charming and Dickensian A Christmas Carol, starring Michael Gambon, Katherine Jenkins and a lot of fish. Asterisk. The law firm's partners get ready to vote, with Harvey hoping he's done enough to keep Jessica in, Daniel out. But he feels betrayed when Louis is made senior partner, and the in-house politics of Pearson Hardman threaten to go against Harvey and Jessica's favour. Elsewhere, Harvey tries to get Donna back. This thoroughly enjoyable 1985 movie about young Holmes and Watson meeting at school and solving mysteries together has all the elements of a Doyle classic with plenty of boyish adventure thrown in thanks to screenwriter Chris Columbus, of Home Alone fame. Nicholas Rowe is excellent as the young Holmes, in a more emotional and impulsive guise than his contemporaries, as he attempts to figure out who is attacking his school with deadly hallucinogenic poisoned darts. Another chance to see the first race of the 2014 season. It kicks off in the Haute Alpes region, before travelling down to Monaco and Nice for the final leg in two stages - one day, one night. One of the sillier and more groan-inducing films in Pierce Brosnan's run as 007. Still, it's full of fun action, and you can never go wrong with Robert Carlyle. Capital One Cup, semi final second leg. Dermot O'Leary hosts the annual telly awards from The O2 in London. The soaps and talent shows will be trying to best each other, while Doctor Who, Broadchurch, Call the Midwife and Downton Abbey are the heavyweights battling for best drama. But it's the fight for the best TV detective that will keep us on tenterhooks, as Sherlock's Benedict Cumberbatch faces stiff competition from Broadchurch's Olivia Colman and Luther's Idris Elba, among others. The Kumar family is back after a seven-year absence. They may have moved, but they're still welcoming movie stars into their house. Tonight's guests are Ray Winstone, Rupert Everett and Dame Diana Rigg. They said David Mitchell's epic novel was unfilmable. And they were mostly right. Using the same six actors to tie together the six different stories spanning from 19th century to post-apocalyptic earth was a stroke of genius, but it was still too monumental a task for the Wachowskis to adapt this dense book for the silver screen. Visually, it's stunning, and while it never quite manages to win everyone over, it's still an accomplishment worth watching. The Angels Take Manhattan. Say farewell to the Ponds, as Amy and Rory bow out of the Doctor's life for ever. A trip to New York City turns terrifying and devastating as the Weeping Angels return and won't be shaken off so easily. "I feel the need... the need for speed." Tom Cruise and Val Kilmer star as US navy pilots who try to outdo each other with their aviators and daredevil flying skills in the hope of catching Kelly McGillis's attention, all to the soundtrack of 80s pop and rock. A compilation of all the best and most interesting bits of the just-finished K series. Stay tuned for Stephen Fry's science-tastic 'knick-knacks' and experiments throughout the show. Keira Knightley and Kenneth Branagh drop by to talk about the new Jack Ryan film, joining comedian Lee Mack and footballer Thierry Henry. One of the best and most enduring action adventure films, with jokes that are still funny no matter how many times you've watched it. Brendan Fraser, John Hannah and Rachel Weisz accidently awaken priest Imhotep from his cursed sarcophagus during an archaeological expedition in Egypt. Anthony Hopkins stars as the legendary filmmaker in a portrayal of his personal and professional life during the filming of the iconic Psycho. Helen Mirren stars as his wife, with Scarlett Johannson as starlet Janet Leigh. Sleight of Hand. After last week's introductory episode setting the scene, the Musketeers must prevent dangerous criminal Vadim from threatening the monarchy - but can they figure out his plan in time? Young d'Artagnan must also convince the swashbuckling troupe of his loyalty, while we can't wait for another glimpse of Peter Capaldi's deliciously Machiavellian Cardinal Richelieu. A fisherman, a mercenary smuggler and a US journalist get embroiled in the ruthless and brutal diamond trade war in Sierra Leone, which is torn apart by political and civil unrest. Stars Leonardo DiCaprio, Djimon Hounsou, and Jennifer Connelly.